Vevox helps to bring your meeting, lecture or conference to life through increasing engagement and interaction. With our customization options the app can seamlessly reflect your brand or corporate identity and promote your event theme to really look the part. Choose to customize the app theme colours and add images and text to create a bespoke look and feel. 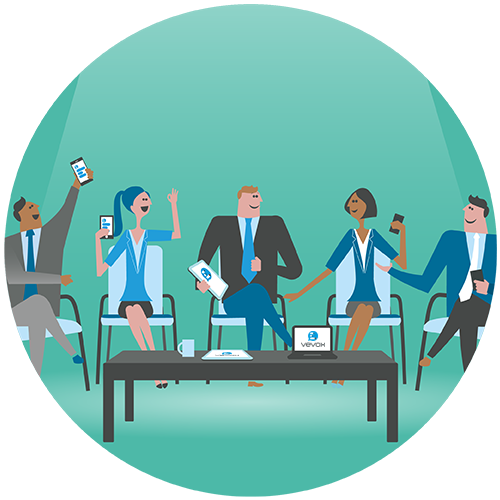 If you're running an internal communications meeting, giving Vevox a virtual 'lick of paint' transforms the app into an in-house corporate tool. Running a conference or themed lecture? Add images of guest speakers, institutional logos or a session agenda to welcome participants and set the scene. Using our colour picker, change the app theme. You can select different colours for the app header and background, results and selections and main text. The info screen greets all participants that join your session using the native or web version of the Vevox App. This is the ideal place to set ground rules for your session or even our instructional welcome message. By using our PowerPoint add-in you can get all the power of Vevox live-polling directly in your presentation slides. Download the add-in and take your PowerPoint slide deck to the next level.